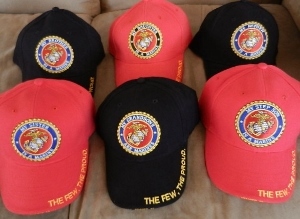 WELCOME FAMILY AND FRIENDS of THE MARINES! Sunday 12p.m. - 6p.m. Monday - Saturday 9a.m. - 6p.m. 50 % OFF FAMILY RELATION CAPS!!! THIS IS A CLOSEOUT... THESE CAPS WILL NOT RE AVAILABLE FOR LONG. GET THEM WHILE THEY LAST! $4 SALE! While supplies last. 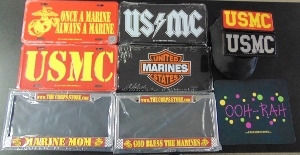 Includes select license tag, license tag frames, hitch covers and a mousepad. 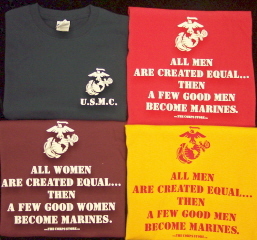 USMC T-shirt available in battalion colors, gray and military green. An alternative shirt to wear on Family Day at Parris Island instead of a relationship shirt. This shirt has it all! 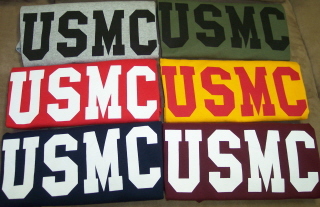 100% pre-shrunk cotton, adult sizes Small thorugh 4XLarge in navy, red, gold or maroon. "MARINES. The Few. The Proud. 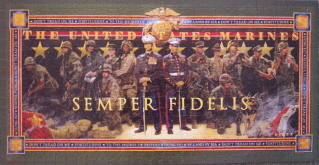 Semper Fi" What else can we say? The back of the family shirts has an Eagle, Globe and Anchor in the center surrounded by My is a Marine with Parris Island under it. 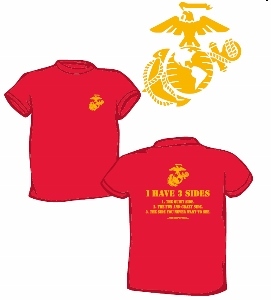 These shirts are great for family day or graduation at Parris Island and are available in training battalion colors. But they were specifically designed without the battalion logos on the back so after graduation you can select your favorite color without being battalion specific. These shirts are heavyweight 100% preshrunk cotton. 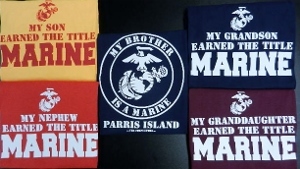 Great selection of 1st Battalion Parris Island t-shirts for the whole family! Heavy 100% PRE-SHRUNK cotton t-shirt. Front and back designs. Corps Store exclusive design Parris Island 1st Battalion Hoodies. Select from 1st Battalion Parris Island, My Son is a Marine, My Brother is a Marine or the bold USMC full zip hoodie. Something for everyone! The USMC full zip hoodie looks great worn over your battalion t-shirt. 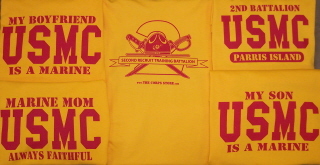 Great selection of 2nd Battalion Parris Island t-shirts for the whole family! Heavy 100% PRE-SHRUNK cotton t-shirt. Front and back designs. Corps Store exclusive design Parris Island 2nd Battalion Hoodies. Select from 2nd Battalion Parris Island, My Son is a Marine, My Brother is a Marine or the bold USMC full zip hoodie. Something for everyone! The USMC full zip hoodie looks great worn over your battalion t-shirt. 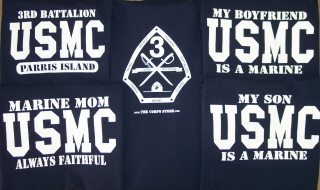 Great selection of 3rd Battalion Parris Island t-shirts for the whole family! Heavy 100% PRE-SHRUNK cotton t-shirt. Front and back designs. Corps Store exclusive design Parris Island 3rd Battalion Hoodies. Select from 3rd Battalion Parris Island, My Son is a Marine, My Grandson is a Marine, My Brother is a Marine, My Boyfriend is a Marine or the bold USMC full zip hoodie. Something for everyone! The USMC full zip hoodie looks great worn over your battalion t-shirt. 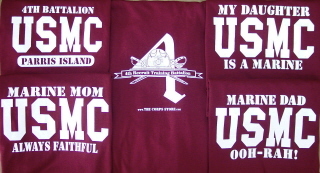 Great selection of 4th Battalion Parris Island t-shirts for the whole family! Heavy 100% PRE-SHRUNK cotton t-shirt. Front and back designs. Corps Store exclusive design Parris Island 4th Battalion Hoodies. Select from 4th Battalion Parris Island, My Daughter is a Marine, My Sister is a Marine or the bold USMC full zip hoodie. Something for everyone! The USMC full zip hoodie looks great worn over your battalion t-shirt. Challange coins... a Marine Corps Tradition! Be the first to give your new Marine a challenge coin or add to your collection. 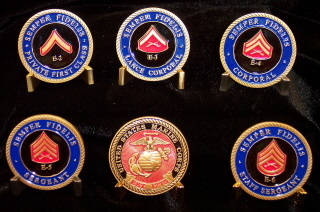 Recruit Training Battalion coins, Marine Corps Birthday coins, Rifleman coin, Bulldog coin, Iwo Jima coin, Hard Corps Marines coin, POW/MIA coin, Corpsman coin, and coins for family members are available. Coins come in a protective clear case. Coin stands for displaying are also available. Our recruit training battalion coins say MCRD Parris Island on the coin (sorry Hollywood Marines) but all other coins are generic. Whether you give them as gifts or collect them yourself, Marine Corps coins are a treasured keepsake! 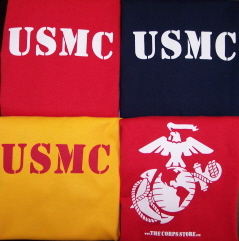 Child's USMC t-shirts with an Eagle, Globe and Anchor on the back. Available is youth sizes small - XL and in red, gold, navy blue, maroon, green digital camo and pink. 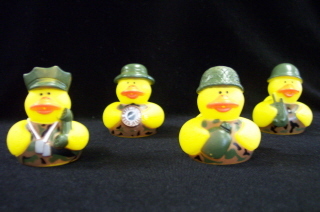 Set of 4 Camo Duckies. Compass,dog tag, canteen,and a walkie talkie. Make this cute set of adorable duckies a part of your fountain or bath. Fun for both adults and childern. 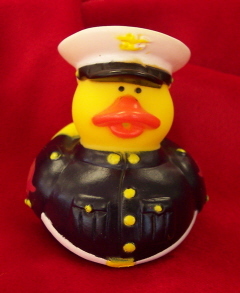 Marine Corps Dress Blues Duckies. These are beautiful and framable jigsaw puzzles. If you can read this, thank a teacher. 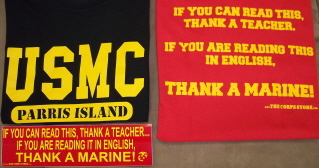 If you are reading this in English, thank a Marine!" Check our these t-shirts and bumper sticker with this popular saying. T-shirts are available in red and black in sizes small - 4XL. If you love the bumper sticker, you'll love it on these shirts. 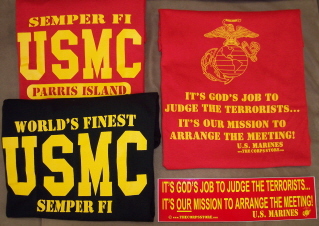 The red shirt has Semper Fi USMC Parris Island and the black shirt has World's Finest shirt has World's Finest USMC Semper Fi on the front the the terrorists saying on the back. 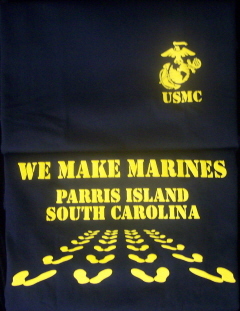 The back design on this heavyweight black 50/50 poly cotton hoodie is "We Make Marines Parris Island South Carolina" and the yellow footprints just like you are getting off the bus! The front of this hoodie has a small Eagle, Globe and Anchor with U.S.M.C. under it. Various military coins including, Saint Michael's, The Brotherhood, Parris Island - Highway to Hell, Spinner EGA, POW/MIA, Iwo Jima, Mascot (Bulldog), Rifleman, and Hard Corps Marines. 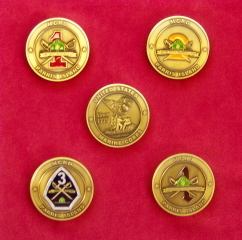 Also check out our family, rank and birthday coins! 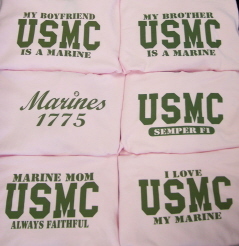 Prettier in pink... our USMC Semper Fi, Marines 1775 hoodie or I Love My Marine, Marine Mom Always Faithful, My Brother is a Marine, My Grandson is a Marine, My Nephew is a Marine, My Husband is a Marine or My Boyfriend is a Marine hoodies with an Eagle, Globe and Anchor on the back. Pink Ladies style cut T-Shirts with olive drab ink. 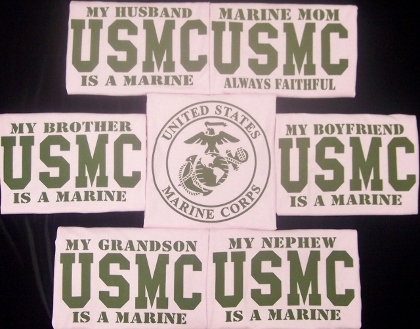 Select from Marine Mom, My Brother is a Marine, My Boyfriend is a Marine, My Husband is a Marine, My Grandson is a Marine, My Nephew is a Marine, I Love My Marine, or God Bless My Marine. 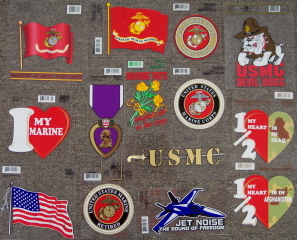 Each back has an EGA with United States Marine Corps. 100% preshrunk cotton. Sizes from S to 2XL. 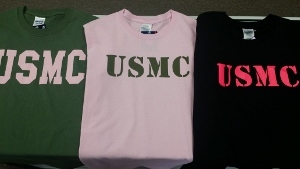 Even USMC looks prettier in pink! 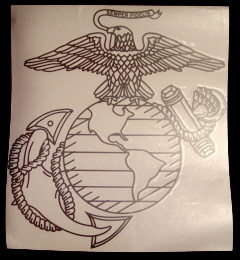 Marine Corps Decals including rank insigna, military campaigns, military divisions, recruit training battalions, window strips, and vinyl transfers. A 10" shite Eagle, Globe and Anchor vinyl tranfer. This is an outside transfer that is great for tinted windows; it is UV and weather resistant. This can be applied to any smooth surface, such as: glass, metal, plastic, etc. 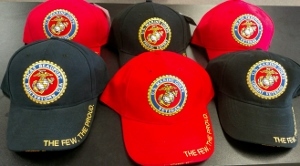 The United States Marine Corps has licensed The Corps Store as an "officially licensed vendor". We are proud to comply with ALL requirements of this agreement. OOH-RAH !! !